From the pharmacy to the meat department to the pet food aisle, 45 rats have been caught at one local grocery store in just the last three months. In tonight's Dirty Dining, Darcy Spears has a new edition of Gross Grocers. Albertsons grocery store on Lake Mead and Boulder Highway was forced to shut down November 7 for an ongoing, multi-generational rat infestation. Records show the store knew about the imminent health hazard and though it's required by code, they failed to report it to the Health District. It took an employee's complaint to bring accountability. The employee wrote to the Health District about "Rats running above our break room on the suspended ceiling and whole store for three months now." The Health District's records show Store Director Kathy Chin said "Widespread pest activity had been documented in the facility since she became director in late August." She showed inspectors a log book indicating 40 different rodent sightings since September 19. Inspectors saw a live rat on top of the dairy cooler and a dead one in a snap trap in the general merchandise room at the front of the store. There were multiple snap traps and glue boards in the pharmacy, meat and pet food areas. Packages of bird feed had been gnawed and fresh rat feces were found on shelves and floors in the back storage area, behind the ice machine in the meat department, under the meat display cooler and in the deli and bakery areas. When we went to Albertsons, Kathy Chin met us at the front of the store and said, "Unfortunately we cannot have cameras inside our stores. I do apologize that they let you in without informing you. I can give you my public relations manager and she can give you all the details about what happened, but we're not allowed to discuss that at the store right now." Albertsons' pest control specialist told health inspectors rodents have been caught there pretty much every day. They said they'd eliminated approximately 45 rats since their three-times weekly service at the store began. 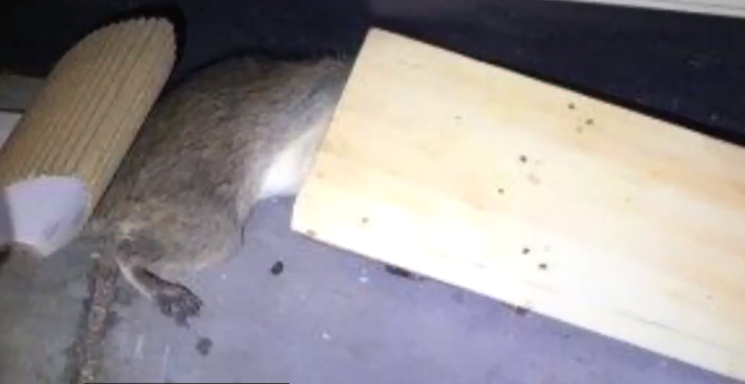 Albertsons' public relations manager would not answer any questions about why they failed to notify the Health District when they first found rats a few months ago. They sent a statement to say: "Albertsons holds its stores to the highest industry standards. Upon learning about the possible pest issue, we took immediate action to remedy the situation and avoid reoccurrence. The store is open and is operating at optimum performance." It reopened November 9 with an A grade. There was another multi-generational infestation--roaches, not rats--at KJ Kitchen Chinese Cuisine on Spring Mountain and Jones. It was shut down November 1 after inspectors found live roaches throughout the facility, including on packaged thawing fish and under the prep table. It was labeled a repeat violation. There was also a sheet pan of egg noodles stored on top of a trash can, uncovered frozen chicken in the freezer and a cleaver stored between a dirty wall and prep table. General Manager Annie Chen said the roaches came out after a full pest control service was performed earlier that week. She said the kitchen is very clean and that they're ramping up their pest service to ensure the bugs don't come back. KJ Kitchen reopened the next day with a zero-demerit A grade. The new location of Vince Neil's Tatuado Eat, Drink, Party on Tropicana between Koval and Paradise was shut down with 44 demerits on October 30. Inspectors saw a food handler return to the kitchen after a restroom break without washing hands. There was expired cut lettuce and multiple foods in the temperature danger zone including baked potatoes, eggs, steak, chicken fingers, spinach dip and more. A container of mayonnaise was stored on top of cut avocados and open bags of rice and flour were not protected from contamination. Containers of prepared food were stored on the floor, all cutting boards on make tables had excessive wear and were heavily soiled and there was black mold on the ice machine chute. A plastic grocery bag was being used to line a container of mashed potatoes inside the steam table, cooked ribs and cream-cheese stuffed mushroom caps had no date labels and the microwave and floors were dirty and greasy. Plus, the person in charge was unable to answer the inspector's questions about food safety. The restaurant was required to schedule a meeting of non-compliance with the Health District and it reopened November 1 with a zero-demerit A grade. Executive Chef Jose Jimenez said they just opened this second location about a month ago and the closure was very embarrassing and shouldn't have happened. He takes full responsibility and said he not only literally cleaned house using a professional staff from the Circus Circus location, but he also 'cleaned house' by switching out the entire kitchen staff. He said they have nothing to hide and welcomed us and our camera at any time. Buffet at Asia on Eastern and Flamingo was shut down October 29 for no hot water. Multiple food handlers were working with raw open foods but not properly washing their hands. Inspectors found two large containers of cooked sweet and sour chicken held past the permitted shelf-life, cut melon at unsafe temperatures and excess food debris on the floor under the prep table and sink. It reopened the next day with a zero-demerit A grade. The owner said there was a broken water heater, which they quickly had fixed, and other than that she had no comment. Checkers on Charleston and Bruce was shut down November 1 for lack of adequate refrigeration--an imminent health hazard that also came with 33 demerits. Inspectors documented improper handwashing and expired chili, nacho cheese and Parmesan garlic wing sauce. Lots of food had to be thrown out due to unsafe temperatures and there was heavy food debris on a vegetable slicer, as well as an employee's cell phone on the make table next to consumer food. Janeth Aguilar sent a statement saying, "The main reason for the closure was a walk-in cooler with high temperature and maintenance was not able to make it on time to fix it when the Health Department was there. The walk-in cooler was fixed that same afternoon. Checkers was re-inspected the following day with a result of 0 demerits, getting back the A grade." VZ Cafe on Sahara and Tenaya was shut down November 1. The inspector left during a routine inspection due to "Person in charge becoming hostile when inspector began checking temperatures of foods in refrigerated storage. Operator did not believe inspector had authority to check temperature of foods present in storage. Inspector unable to determine compliance with foodborne illness risk factors." According to the inspection, the person in charge said the cafe is no longer in business as a restaurant and the kitchen is used only for their catering business and dance studio banquets. The Health District issued a cease and desist order. The person in charge told us he has the cleanest kitchen in town and they only started having issues after a new inspector was assigned to their facility. He said he's waiting on plan review with the Health District in early December, after which he hopes to re-open for catering and banquets.